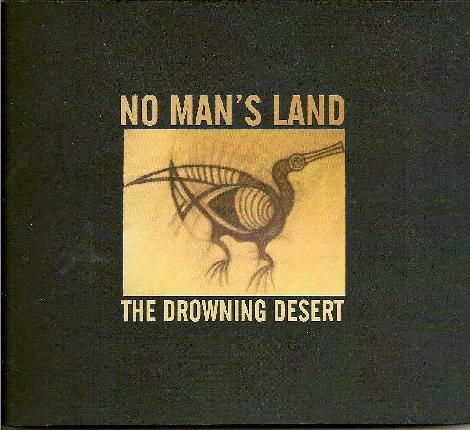 No Man's Land - "The Drowning Desert"
No Man's Land is a band out of Athens, Greece. They've been together since the late 80's, exploring a mixture of prog rock, psychedelia and jazz. The Drowning Desert is their 5th album. This is progressive rock that isn't about flashy solos or incredibly complicated arrangements. It's a sound that relies more on developing moods and textures. Amidst the usual guitars, drum and bass are also analog synth sounds and trumpet and flugelhorn. I have a hard time comparing them to anyone else, because they've created a very unique sound that is all their own. Despite the playful use of a toneless analog synth to create unusual noises throughout, this is not music that is overly experimental or inaccessible. The lush atmospheres and intriguing textures swirl around composed songs that have thoughtful, poetic lyrics (sung in English) that explore the inner workings of the psyche, life's journey and a spirituality that is constantly questioning. I don't usually comment much on the vocals, but guitarist Bas Athanassiades' voice is very easy on the ears, very pleasant to listen to, especially when he's singing the soulful and expressive melodies that the band has composed. There's also some loose and very beautiful vocal harmonies here and there. The horns really give this band's sound a deeper emotional tone too, exemplified by the snaky, vaguely Middle Eastern improvisations Don Fuestenberg pulls off on the dazzling instrumental title track, but also throughout the rest of the album. The band likes to stretch out and explore. Most of the songs are in the 7-10 minute range and the players use the time well to delve into some great instrumental passages. The 7 1/2 minute Tell the Moon, for example, opens with nearly 4 1/2 minutes of instrumental searching, "diving into truth, braiding our life's groove" as lyrics later in the song suggest. The Drowning Desert is a mature, rich and rewarding album, for lovers of music that is both challenging yet also very easy to listen to. I thoroughly enjoyed it.